There’s currently a story circulating on Facebook about the bicycle in the tree on Vashon Island. It’s a made-up story of a boy who left his bike by the tree, went off to war in 1914 and never came back. I intend to set the record straight. 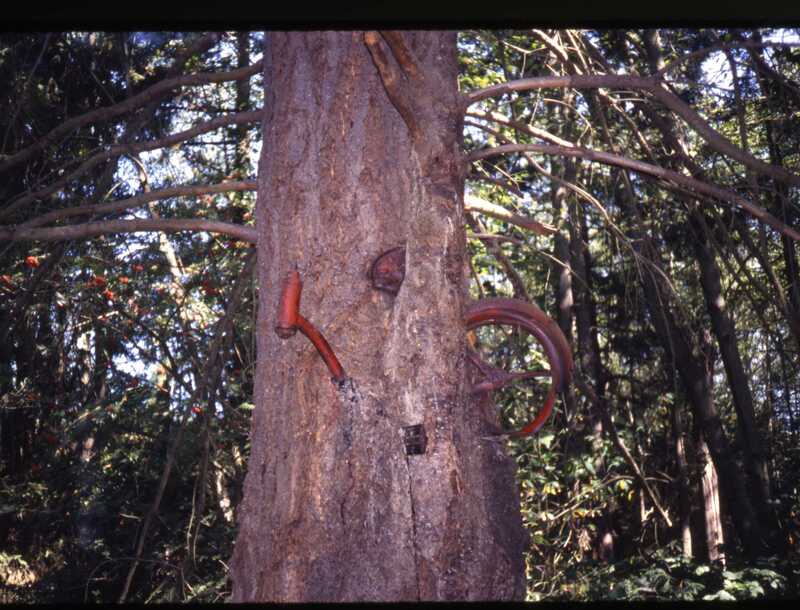 In actuality there is a bicycle that a tree grew around on Vashon Island. But the true story of how it got there is quite different. In 1954 Helen Puz (who is now 99 years old) moved to Center with her five children. At that time she had been recently widowed. Don was none too happy having a girls bike, said Puz, but it was better than none. One day Don told his mother that he had lost his bike and he wasn’t sure where he’d left it. They both let it go because Don was a little embarrassed to be riding a girl’s bike anyway. Forty years later Puz read in the Beachcomber, Vashon’s newspaper, that someone had discovered a bike up in a tree near Sound Food. The bike was five feet off the ground and the tree had grown around it. News of the tree bike even carried to Japan where they made a film about it. The mystery of where Don Puz left his bike had finally been solved. If you’d like to see the bike in the tree, directions on how to get there can be found at roadsideamerica.com. This entry was posted in Family Fun, Free, Museums, Roadside Attractions, Towns and tagged Beach Comber, bicycle tree, Don Puz, Helen Puz, Sound Food, Tree Bike, Vashon Island, Vashon-Maury Island Heritage Museum on March 26, 2012 by admin.